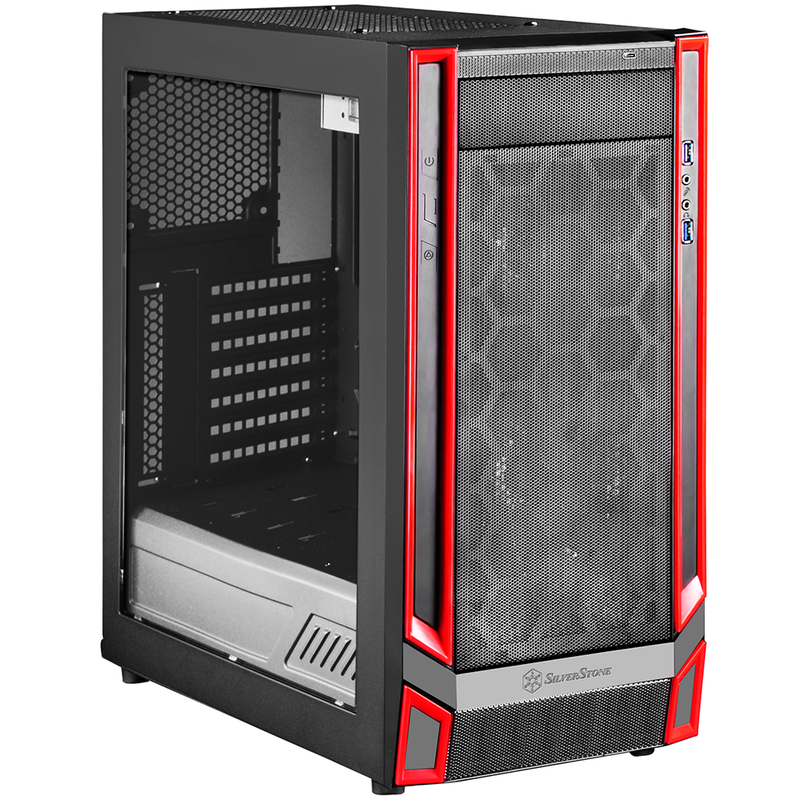 I'm known to appreciate a good bargain, so when the £50 SilverStone Redline Series RL05 arrived at my door, I was naturally keen to see what a low-cost chassis would have to offer for today's PC builders. It's fair to say I've come away impressed, as the RL05 punches well above its weight while throwing in a few welcome surprises. First impressions are likely to be mixed, as the enclosure's plastic facade and red-on-black styling is very much an acquired taste. This is the sort of design that tends to play well with gamers in Eastern markets, however users seeking a sleeker aesthetic may prefer the all-black model that's referenced on the official product page but currently unavailable from UK stores. If you happen to like the red accents, you may well appreciate some of the other design elements. 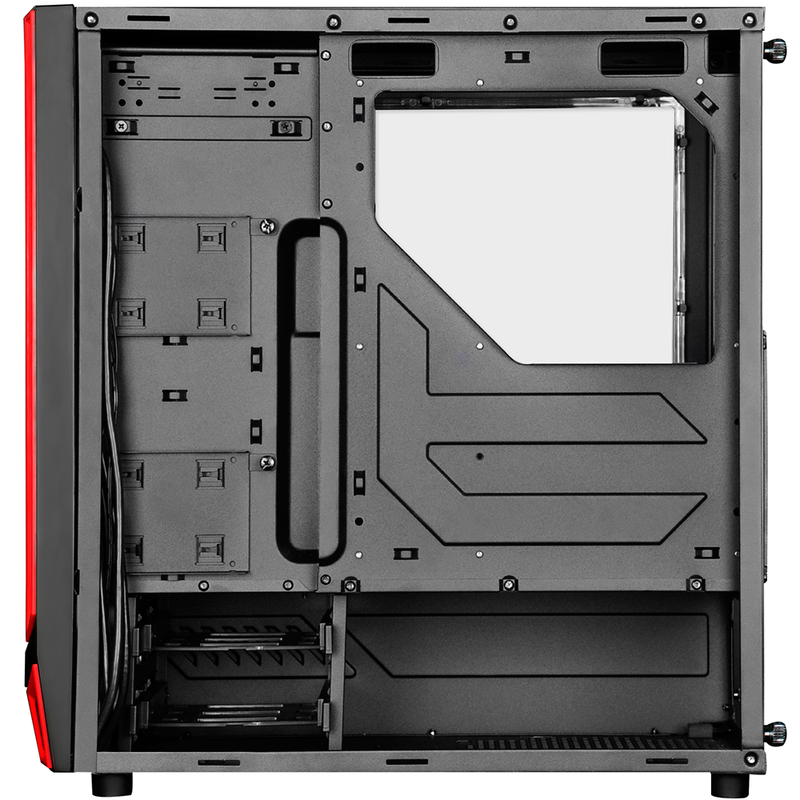 The side window, for example, is well-sized and ideal for showing off your internal components, and the RL05's frame measures 210mm (W) x 465mm (H) x 450mm (D), making it a reasonably compact choice in the mid-tower segment. 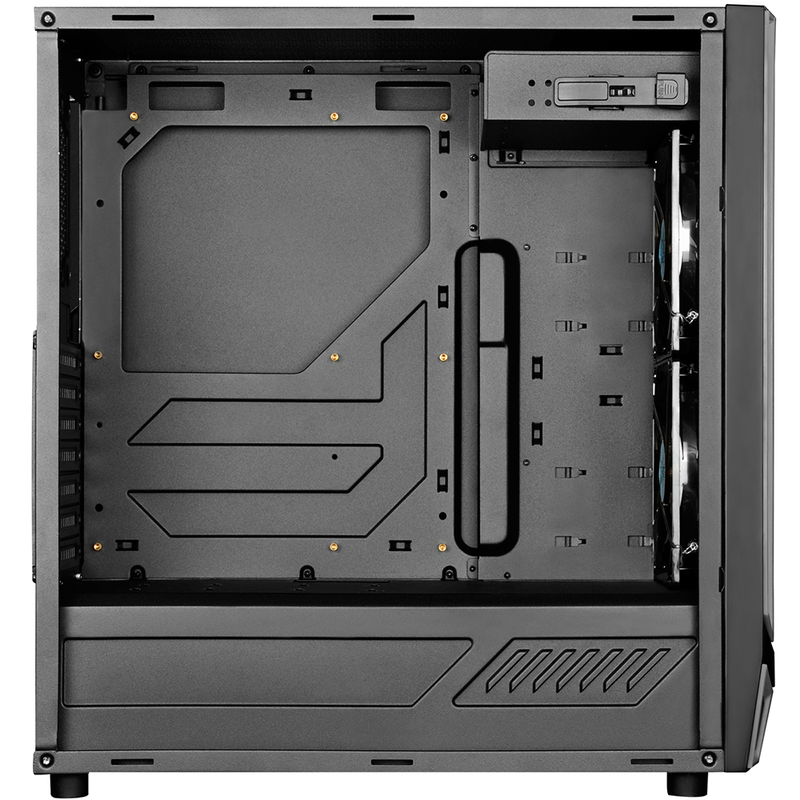 From a size and layout perspective, the RL05 shares an uncanny resemblance to the recently reviewed NZXT S340 Elite, yet while the latter is pricier and undoubtedly more stylish, the SilverStone costs considerably less and has a couple of features that NZXT missed. These include a tool-free, 5.25in optical drive bay and front-facing USB Type-C near the top-front edge. The rest of the I/O ports and buttons are positioned either side of the front mesh, with power, LED and reset on the left, and two USB 3.0 ports and audio jacks on the right. Do note that your motherboard will require a pair of 19-pin USB headers in order to make best use of the ports, or alternatively a PCIe expansion card. 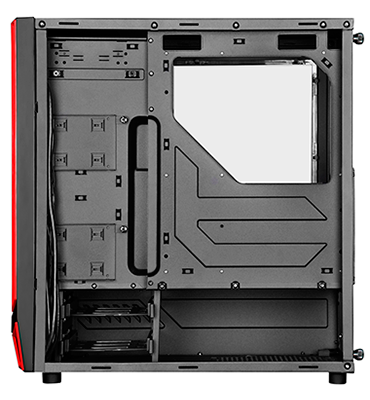 Build quality is reasonable throughout, but as you might expect at this price point, the outer panels aren't made of the thickest materials and will show signs of flex under heavy force. As far as user-friendly enhancements are concerned, it's a mixed bag with the RL05 ticking some boxes and leaving other unchecked. 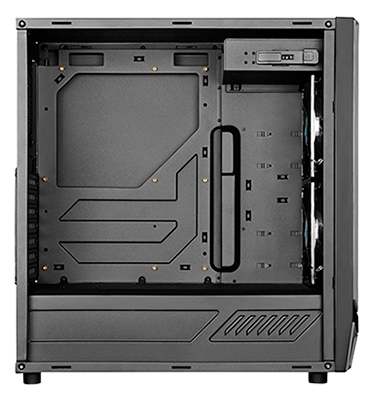 In the plus column, the interior is all black, there's a good-sized cutout in the motherboard tray, the PSU bay is lined with four padded mounts, and the slot between the motherboard tray and raised panel alongside makes it easy to route cables and keep the clutter hidden from view. 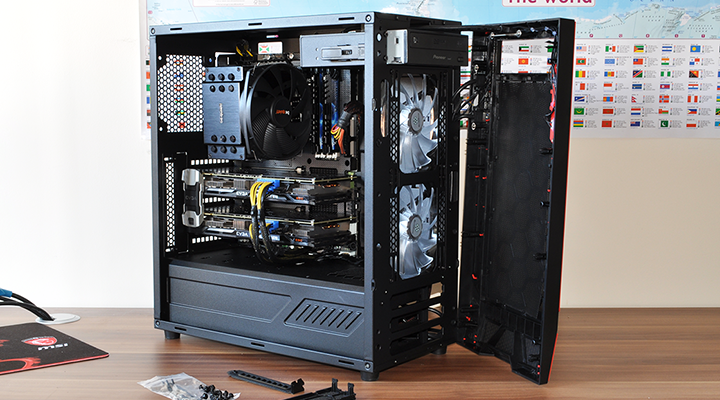 In the negative column, the power supply slots in from the side as opposed to the back, making it slightly more tricky to work with, the I/O cables are hard-wired to the front panel in such a way that it needs to removed carefully, and the two dust filters - below the PSU bay and behind the front cover - are merely thin sheets of mesh that aren't particularly easy to get at but can be removed for cleaning. We're entering nit-picking territory, but while we're here, it's also worth pointing out that the motherboard standoffs aren't pre-installed and the bundled screws and fixings are all supplied in one bag, rather than being separated and labelled for ease of use. You can't have everything at the £50 price point, yet start putting components in and you soon begin to appreciate what the RL05 has to offer. 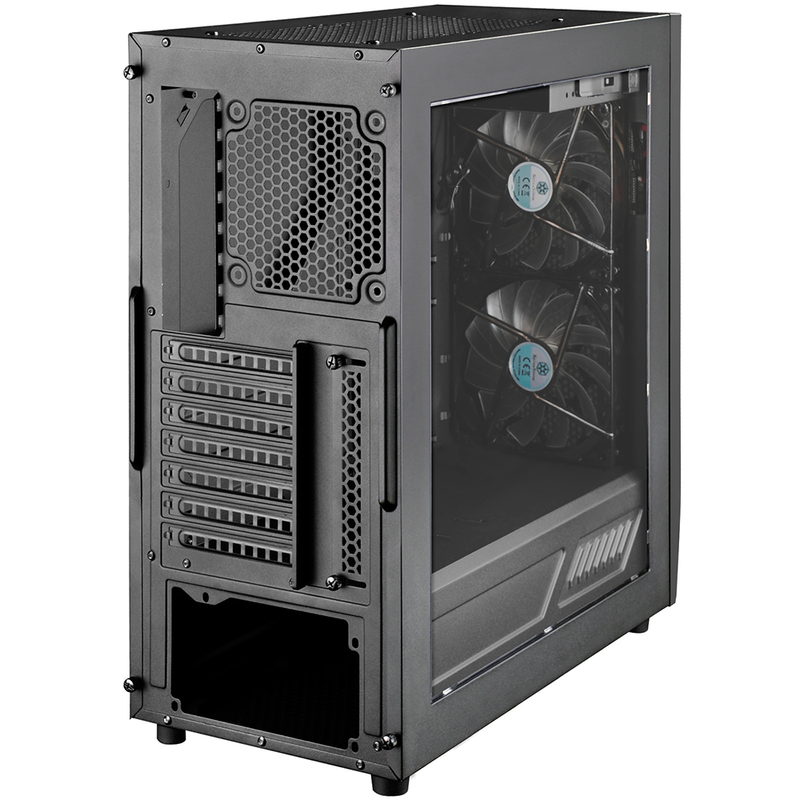 Our dual-GPU, ATX test platform fits with ease and the internal space proves generous - graphics cards can measure up to 373mm in length, a CPU cooler can stand up to 165mm tall and there's room for a 220mm PSU. 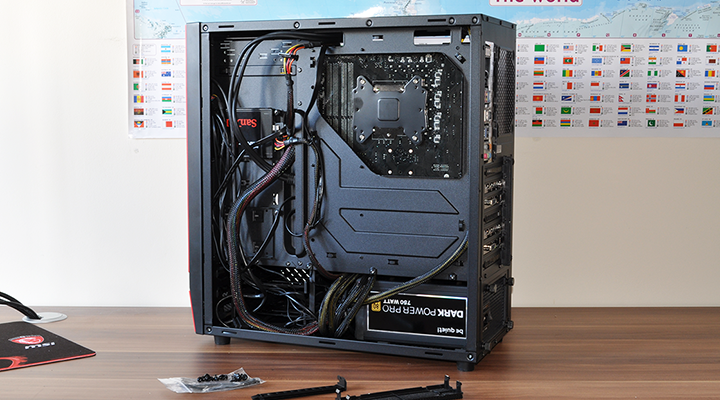 Routing cables over the motherboard tray is a cinch and others can be pushed up through the PSU shroud. The layout ultimately works, yet what's unusual is SilverStone's standard fan arrangement. In its default configuration, the RL05 doesn't include an active exhaust but instead offers dual three-pin 140mm front intakes with red LEDs. 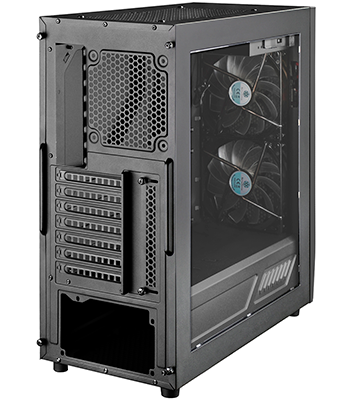 There is room for a 120mm fan to be added to the rear, as well as two spare 120/140mm mounts up top, and if you're willing to give up the optical bay, you could squeeze in a 240/280mm radiator. 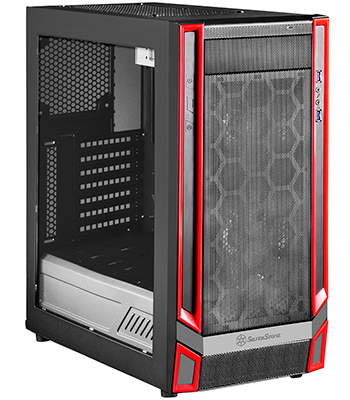 The days of 10-plus storage bays appear to be long gone on most modern enclosures and SilverStone's recipe covers most bases. 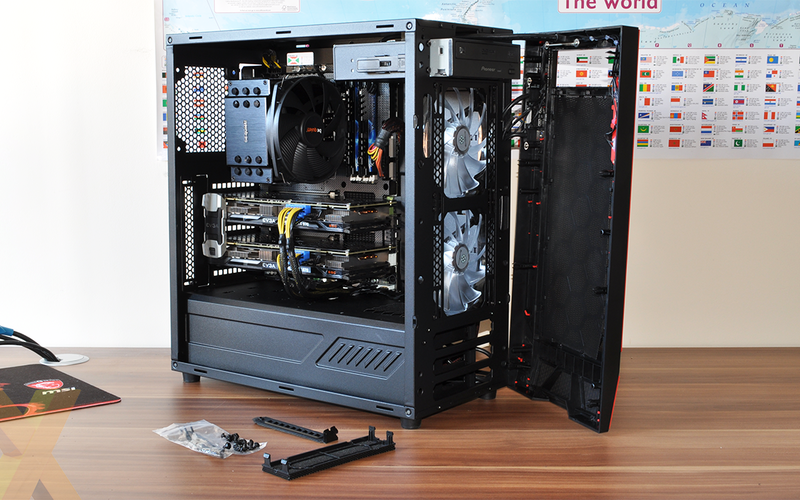 In addition to the 5.25in optical bay, there are two removable 2.5in drive sleds attached to the rear of the side plate, and a drive cage at the end of the PSU compartment allows for two 3.5in hard disks. If you're of the opinion your SSDs ought to be on show, both 2.5in sleds can be relocated on top of the PSU shroud for front visibility. 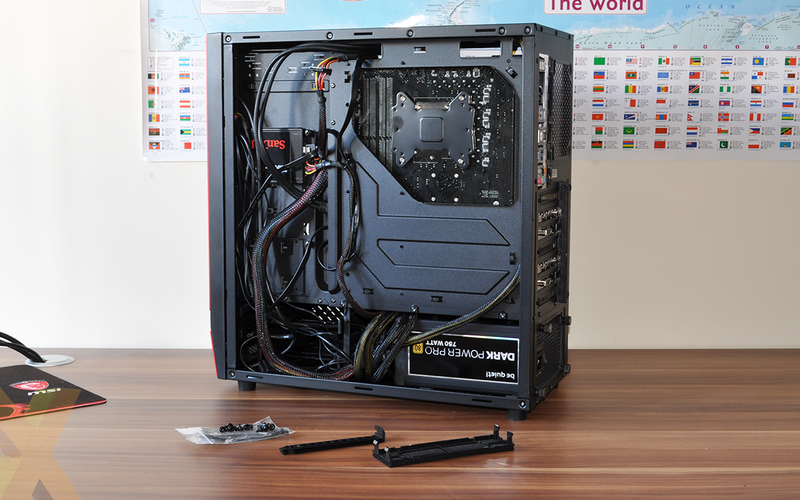 A good amount of empty space in the bottom section is useful for stowing excess cables, and you will want to keep things relatively neat in order to re-attach the notched side panel with minimal fuss. There aren't any other fanciful features of note - you won't find a fan controller or sound-dampening linings - but all things considered, the RL05 is shaping up to be a competent solution in the sub-£50 market.